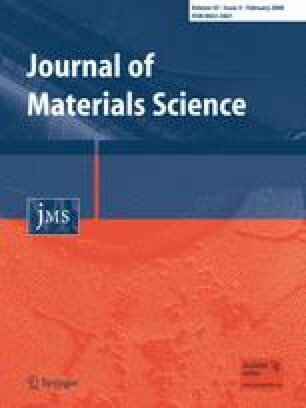 Three different Cr–Ni alloys were deposited on the surface of Fe3Al intermetallic by shielded metal arc welding (SMAW) to investigate the weldability of this material. The microstructure, phase constitutions, and fine structures of Cr–Ni surfacing layers were analyzed via metalloscope, SEM, XRD, and TEM. The results indicated that the Fe3Al/Cr–Ni joint shows no cracks when Cr25–Ni13 alloy was deposited. The surfacing layer consisted of austenite (A), pro-eutectoid ferrite (PF), carbide-free bainite (CFB), lath martensite (LM), and little acicular ferrite (AF). Phase constitutions of the joint included Fe3Al, FeAl, γ-(Fe,C), γ-(Fe,Ni), NiAl, and Ni3Al. The lattice orientation for CFB between α and γ phases was (110)α//(111)γ. Typical LM was composed of interlayer-carbide and α ferrite of 400 nm in length and 40 nm in width. This project was sponsored by the National Natural Science Foundation of China (50375088) and Doctoral Foundation of Shandong Province (2006BS04004) and Development project of Science and Technology of Shandong Province (2007GG10004016).